First off…Have you read the “When I was Little” series over at The Adventures of Rose Red? If not you should. They’re so adorable and it’s fun to see bloggers in all their childhood glory – such a great idea Kellie! AND…my “when I was Little” list has just been posted today :). 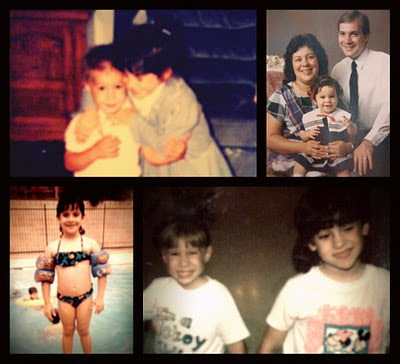 Here’s a little sneak peek at some childhood photos, but if you want to read my list feel free to check it out here. So…when I first started doing “Fill in the Blank Fridays” here at my blog I thought it would just be a one time thing, and for the simple reason that I couldn’t think of more than seven blanks, that became the “magic number” of blanks you’ve all been filling out each week. Well…since I didn’t do this Friday post last week because of our impromptu road trip I decided to make it up to you by including three bonus questions this week, for a grand total of 10 questions :). If you want to play along and fill in your own blanks, please do, and then link back here using the MckLinky below so that we can all read your answers. Now for some blanks! Oh…and P.S. The giraffe in the photo below was one I kissed at a giraffe orphanage in Kenya. Isn’t she cute? 1. The strangest thing I’ve ever eaten was at a restaurant in Kenya called Carnivore…all you can eat meat. I tried ostrich meatballs, goat and crocodile. The goat was pretty tasty . 2. My best friend is the greatest. He’s funny and sweet and pretty darn cute. Oh yeah…and by the way Craig…it’s you 🙂 . 3. If I could live in a different era it would be the 1950’s because I really like the idea of cooking in heels and pearls, plus I feel like things were probably simpler then…not perfect, but simpler . 4. I like when people practice random acts of kindness. It makes the world a happier place to . 5. If you only know one thing about me it should be that I love Jesus. I’m not perfect in my faith…I actually struggle often, but I’m trying to love others the way He did…without judgement and/or expectation. It’s a work in progess . 6. My favorite book of all time is “Alexander and the Terrible, Horrible, No Good, Very Bad Day” by Judith Viorst. I had the entire thing memorized when I was a kid . 7. The one beauty product I couldn’t live without is it’s a tie between under eye concealer and blush. I just can’t decide. I have olive toned skin, so I look like death warmed up without any blush, but I also get terrible dark circles, so I don’t think I could do without that either. Oh…and P.S. any suggestions for miracle working dark circle removing creams are much appreciated 🙂 . 8. Blogging is something that makes me very happy. It’s been such a great way to express myself creatively, and my blog has become sort of like my “baby” and I enjoy putting time into it and watching it grow and change. And more than anything I’ve made so many great friends through blogging and you all encourage me daily with your sweet comments. .
9. If I could star in a movie with any actor/actress I would want to work with Zooey Deschanel. I have a total girl crush on her…along with every other girl in the known world. I think she’d be so much fun. Although, I might actually choose Morgan Freeman. He’s pretty much awesome . 10. One of the best feelings in the world is when Craig comes up and hugs me in the middle of a fight, and all my frustration melts away and I feel safe and loved . Hope you guys enjoyed the extra questions! Oh…and P.S. You should probably watch this video. It’s hillarious and just about the cutest thing ever. Kids make me happy. I also had crocodile and ostrich! Well, I think it was ostrich… I’m almost positive, if it wasn’t, then it was something equally as strange. And I love Zooey 🙂 And love to watch your blog develop as well! Everyone loves Zooey Deschanel – fact. Have you listened to the new She & Him CD yet? It is rather brilliant. – Mrs. March in “Little Women” by Louisa May Alcott. Yess! Thanks so much for doing this, Lauren. It’s my first Friday filling in the blanks, and I had a lot of fun! I have tried Alligator – I wonder if crocodile is similar tasting! I looove Zooey. She was my answer too. I still am totally in love with this idea, I have so much fun doing it. Thank you! That video is ADORABLE!!! Kids are hilarious. I also love Zooey. And now I want to go to Kenya to hang out with giraffes and eat goat!! Great minds think alike, I suppose. Thanks for always making these..I look forward to them every Friday! 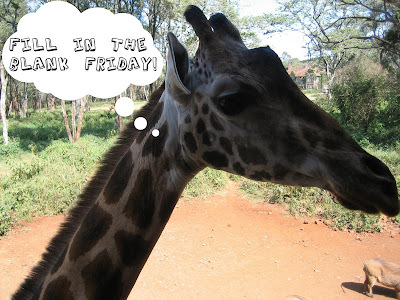 I’m glad that FILL IN THE BLANK FRIDAY is back. Goat is something used here in the Philippines for Caldereta and other dishes, but I’m not aware of them. I don’t eat it, but people I know who do, just tell me that goat tastes like lamb. Still! Blogging is really fun and it’s done a lot of good things for me. And comments can definitely make your day! Love FIll In The Blank Fridays and kinds missed it last week. Agreed – Zooey D. is such a girls’ favorite and that video is so cute! Not to mention I love the SNL spoof of it. I love these and look forward to them every friday!! OMG you are too cute! And we have more in common that i realized – like #5 & 6! I can’t believe that was your favorite book! Mine too! hahahahaha that video was adorable! i love it!! haha so cute. and i love all your answers. i feel like we are soul sisters..haha as cheesy as that sounds! i am so glad we have become such great friends through blogging.. i miss you tons!! i feel like i am a terrible friend.. sometimes i wish life could just slow down so i could have more time to blog and catch up with people! i hope you have a lovely day lauren! and a great weekend 🙂 i am soooo glad it is friday! love your answer to number five! im so glad you posted that video- ive heard so much about it but have yet to see it! 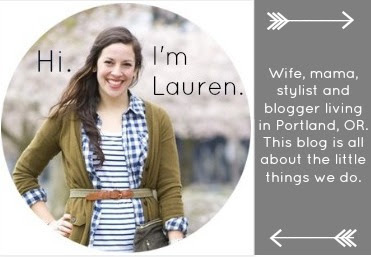 i love you #5- it’s so nice meeting and making blogger friends that feel the same in that way. esp since we can all agree that we all struggle and arent perfect. just trying to love others is something i’m a work in progess on too. That video is the best thing I have seen in a long time. Zooey Deschanel is adorable and always dressed so super cute. The new she & him album is great, I highly recommend if it you haven’t listened to it yet. i LOVE the giraffe photo, they’re my fave animal! p.s.-i’d love to hear more about your kenya trip! This is a great list. I agree that random acts of kindness make the world a better place. The Olay definitive eye cream is the best I’ve found, and makeup goes easily over it. I saw that video a few days ago, so funny! Love the childhood photos, cute! That video is too cute! 🙂 I just found your blog today, and I’m loving it. 1) I heart Zooey D, too. She is amazing for realsies. 2) My favorite part of that video is the girl in the middle. And soon as her fun is ruined by the wimpy little cryer, she just folds her arms and glares. Hilarious! p.s. my blanks are on their way! Hey… Great idea! This is my first time here. I tried to add my link to the McLinky list but it wasn’t happening. Here’s my link anyway. p.p.s. i was a browsing a bit through people’s answers, and it seems like alligator is a top contestant for strangest food! who knew so many people had eaten alligator! and all over the world too! i’ve had it as well (at a brazilian restaurant in Montreal, of all places! ), but i guess i never considered it one of the weirdest things i’ve eaten! I love that video! I miss the days when I would have been destroyed by something like that! Life was so simple when you were small enough to fit in a car seat. I also love the little girl in the middle who was just not amused by the whole situation! oh i do not miss those arm floaty things one bit! i used to hate wearing them, and even though i could swim, my mom STILL put them on me! i’m with you on #5. i feel like it’s an uphill battle everyday to be a good Christian, but i’ll keep on fighting that battle because i know it’s one completely worthwhile! I hope you have a good weekend! XOXOXO! Oh man! I love eating weird stuff!! My favorites have been Kangaroo, Reindeer, Escargot, and Wild Boar… I also have had Crocodile, Emu, Ostrich, Shark, Rabbit, Buffalo… Other weird things: haggis, blood sausage, vegemite. ehhh…..
That video was awesome! hahaha. he was SO cute rockin out, poor lil guy, he has NO idea what single ladies means haha. the dad is funny. haha…that was seriously cute! I think I like the dad’s reaction more than the kid…lol. And the girls are so funny with their dance moves. THAT IS THE BEST VIDEO EVER!!! I love the little girl in the middle crossing her arms and looking towards the dad SOOOO annoyed! Haha! He totally killed the mood! This week has been manic and I am sorry to not have been able to join in but loved reading yours and that video was so cute! oh man i missed it. 🙁 I can’t even come up with what I did last Friday…so bad. 🙁 Isn’t goat meat interesting? I had it once and kinda had to say YES, please more! Goat milk is good too by the way. 😉 Oh well…it’s past midnight and I’m talking about food. 😉 Typical. Have a fantastic rest of the week girl.